What is a ganglion cyst? How do I know if this thing on my hand is one? Questions like these are ones we address regularly. The purpose of this resource is to list all of these queries in one place, and hopefully we can make this the first port of call for anyone going through similar. Ganglion cysts are fluid-filled swellings which typically develop near a joint or tendon sheath. The NHS information resource explains that ganglion cysts can range from ‘a pea to a golf ball’ in size. As they are filled with synovial fluid, they are often described as gelatinous in nature. Synovial fluid is the lubricant that surrounds joints and tendons in the hands and wrists. Over time these cysts can become large and unsightly, however it is important to remember that ganglion cysts are not cancerous in any form. While ganglion cysts can occur on most areas of the body, they are most commonly found on the back of the wrist. Other locations include the front of the wrist, the balm and the base of the finger. Ganglions are entirely harmless but can be painful at times. If they aren’t affecting your quality of life then it is usually advised that they are left alone. Although it may take some time, ganglion cysts can disappear without further treatment. The exact cause of a ganglion cyst is not yet known. Research indicates that they occur when synovial fluid leaks from a joint and collects in a sac. This can be the result of trauma such as outstretching a hand to break a fall. Other research highlights that cysts could occur due to the degeneration of tissue lining near the joint, or the tendon sheath itself. They are commonly associated with hand and wrist arthritis for this reason. It is believed that there is a one-way ‘valve’ that allows fluid into the cyst, but not back towards the tissue and tendon. Are there different types of Ganglion Cysts? Dependent on location and symptoms, you could be diagnosed with any of four types of ganglion cyst. Typically associated with wrist arthritis, which is common with the elderly. Aspiration can be administered to drain the cyst, but care will be taken to avoid the radial artery. The risk of recurrence after surgery is around 30%, and problems after surgery include persistent pain, loss of wrist movement and trapping of nerve branches in the scar. For these reasons, many surgeons advise against operation for these cysts. These typically occur in young adults but then have a habit of disappearing over time. Aspiration, which is explained below, can reduce the swelling but this can return as the synovial fluid drains back into the cyst. Recurrence probability post-surgery stands at around 10%, and there are a number of risk factors including persistent pain, loss of joint manoeuvrability and scarring. Unlike palmar wrist ganglions, but more like dorsal wrist ganglions, these also typically occur in young adults. They are located at the base of the finger, and therefore cause pain when you are gripping an object. These cysts can be punctured with a pin after doing so, fewer than half will return. Finally, dorsal digital ganglions often accompany osteoarthritis of the finger. Pressure from the cyst may affect the fingernail. Occasionally the cyst can leak fluid. Here is an example of small operation to remove a ganglion from a finger joint. Their location. 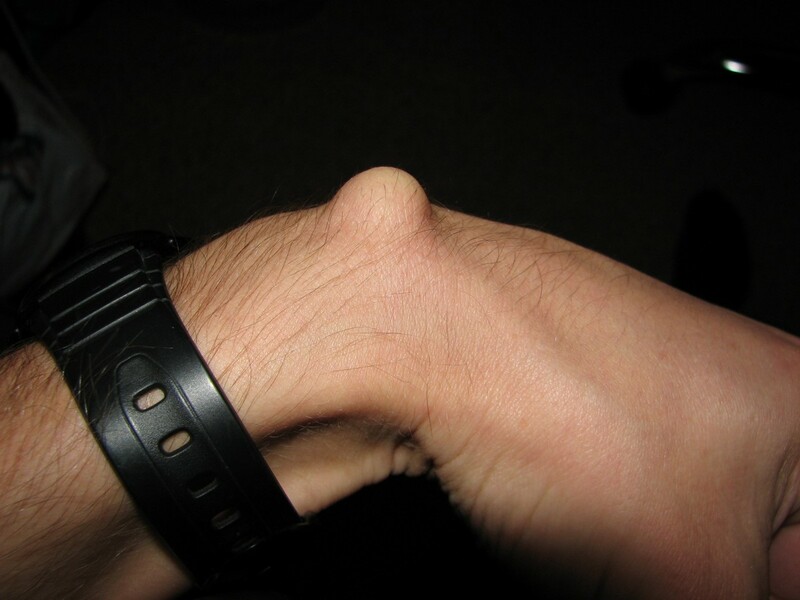 Ganglion cysts typically develop within close proximity to the tendons or joints of your hands and wrists. Their shape. In their common form, ganglions are round or oval shaped. You may find that they increase in size after repetitive use of the joint they are situated upon. The pain. As mentioned above, ganglion cysts are typically painless growths. However there may be a degree of discomfort localised to the cyst itself. Often this is coupled with a limited range of joint motion, especially if the ganglion is large and located directly around a joint. More often than not, a ganglion cyst will be diagnosed just by talking through your symptoms with your doctor. Your doctor will also examine the cyst to ensure that the shape and location are typical of a ganglion. With larger cysts your doctor may look to rule out disorders like synovitis. During your exam, your doctor may shine a light on the mass to test whether the it travels through the cyst. This is to help determine whether the cyst is indeed liquid-filled, because it the light fails to shine through then there may be solid mass inside the cyst. They will also apply pressure to the cyst to test for tenderness and pain and this will be the main gauge as to whether further action is needed. Should your doctor wish to elevate your diagnosis and testing to the next stage, then they may recommend imaging methods such as X-rays, ultrasound or an MRI. This will be undertaken to dismiss any other more serious conditions such as arthritis. Finally, there is a chance that your doctor may confirm the diagnosis via a process called aspiration. A needle and syringe will be used to draw out the fluid that fills the cyst. Your doctor will analyse the consistency and colour of the liquid. Ganglions will be filled with a thick, clear fluid. I am so pleased to have been treated by Miss Hajipour, she was very professional and caring throughout the whole process from the initial consultation to being discharged after my carpal tunnel decompression operation. She was very clear with regards to the operation and after care. I had complete trust in her and am so pleased with the results now. Patient at BMI The Alexandra Hospital, 11th April 2018. To read more reviews please click here. Do not try to burst the cyst yourself. Ganglions are to be left alone if they are small and do not cause any significant pain. For those who are suffering with minor pain, you may be prescribed medication to alleviate these symptoms. As mentioned above, the aspiration process can be used to drain the build up of synovial fluid. Usually, your doctor will undertake this process for diagnostic measures – should it highlight that growth is indeed a ganglion, they will continue to drain the cyst. Treatment on the palm side of the wrist is often more precarious due to the close proximity to the radial artery. If the cyst is causing serious pain or the size of the growth is becoming problematic then the removal of the cyst may be considered. Otherwise, the treatment options above are much more likely to be considered. Dependent on the size of the ganglion, the surgical procedure is performed under local, regional or general anaesthesia. The procedure involves directly removing the cyst and cutting a small piece of the joint capsule or tendon. Post-surgery, a splint may be used for a short period of time. This allows for a degree of comfort throughout the recovery process. It can be followed by an exercise program. The NHS do not generally fund treatment for ganglion cysts unless they cause overwhelming pain or directly impact someone’s standard of living. mIf your reasons for wanting a cyst removed are purely cosmetic, then you’ll most likely have to pay for private treatment elsewhere. Miss Hajipour, was nothing but professional but also human throughout! She put me at ease with her natural ease with people and kept me calm throughout both my procedures with her. She clearly take pride in her work and cares about the people making sure any scars left are minimal and so neat. Great aftercare with clear instructions on how to look after my wrist for the mo the after my surgery. Thank you for making the experience much easier than it should have been! Patient at BMI The Alexandra Hospital, 2nd April 2018. To read more reviews please click here. What are the risk factors associated with surgery? Surgical treatment will result in localised joint stiffness, this is unavoidable if work has been done on the tendon sheath. The risk of any postoperative injection is very low. There is around a 10% chance of the ganglion recurring post surgery, even if the cyst has been exercised during surgery.